Due to the fact that my children are five and under and given the fact that we intend to home school, I'd rather find books that deal with this holiday in a way which has the characters sharing or showing love to and with family members and close friends. It is easier to identify the holiday as it relates to family members at present. When I saw the following two titles available from Candlewick Press, I knew I wanted to check them out. I had high hopes that they'd suit us well -- and I was right! They do! 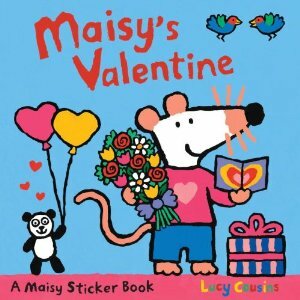 Another cute story involving Maisy! 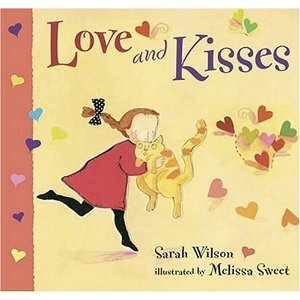 Love and Kisses is available both as a paperback and a board book. (We were sent a copy of the board book for review purposes.) In this positively delightful story we explore what happens if you start a kiss going. Kiss your cat and your cat might then go and kiss a cow who might then go and kiss a giggling goose and so on and so forth. The kiss circles 'round back to the cat who will likely come back and kiss you! This book is simplistic and sweet. (It's even illustrated by a gal by the last name of Sweet so you know it can't go wrong!) I think this book is very friendly and fun to read. I'm glad to add to this our home library as it is perfectly suited for who we are as a family. Thank you, Candlewick Press, for sending a copy of these books in our direction! We love them! So sweet! We love Maisy. My 5 year old once kissed a giant snake. Thankfully she was only 3 or so...maybe 2?? Eek. Just found your blog and love it! I was looking for questions to ask tonight at the book club I lead and somehow found it. Although not just for Valentine's day, a book both of my children have loved is Never Too Little to Love by Jeanne Willis. Each page builds upon the previous in word and paper. It is very cute and sweet. I have you on my reader now and I'm so excited because I love, love to read. Both of those look really sweet. We brought home a stack of Valentine's books from the library. It's hard to find Valentine books NOT about exchanging books at school.